The next meeting of the Pattaya City Expats Club (PCEC) will be held on Sunday, August 6. Andy Barraclough will talk about “Dengue Fever: The Basics of what, where, when, and how with advice on how to avoid it, and the status of new vaccines.” The program starts at 10:30 a.m. with a buffet breakfast available from 9:00 to 11:00 a.m. on the 4th floor of the Holiday Inn’s Executive Tower, located behind the Holiday Inn’s Bay Tower on Beach Road. The British Chamber of Commerce Thailand (BCCT) presents an Eastern Seaboard ‘After Hours’ networking evening at Jameson’s Irish Pub Pattaya on Friday, August 4. Enjoy free finger food and ‘happy hour’ drink prices from 5 p.m. – 8 p.m. All welcome. For directions to the venue, visit: www.jamesons-pattaya.com. Lodge Pattaya West Winds (LPWW) will hold its Summer Party on Saturday, August 5 at the Siam Bayshore Resort Pattaya. This is the Lodge’s major fund raiding activity for the year and as well as a full international and Thai buffet, there will be free flow beer, red & white wine, soft drinks, a live band, a raffle and an auction carried out by renowned auctioneer John Collingbourne. Please join for what will be a terrific evening and a way to help those less privileged in society. Donations of items for the raffle and auction will also be greatly appreciated. Tickets are priced at: 1,500 THB for adults in advance or 1,750 THB at the door (750 THB children in advance or 875 THB at the door). Free of charge for children under 8-year-old. Tickets available by emailing: [email protected]. Pattaya Soul Club presents another of its popular charity ‘Souled Out’ music events at the Access Inn, Pattaya 3rd Road on Saturday, August 5 (doors open at 8 p.m.). 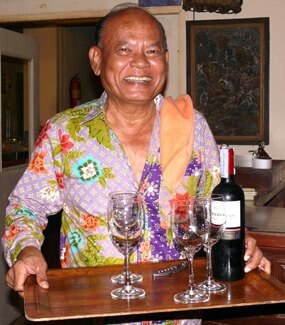 Admission price of 500 baht includes a free flow of wine and San Miguel beer from 8 p.m. – 10 p.m. or while stocks last. All proceeds from the event will be donated to the ‘Take Care Kids’ Foundation. Visit FB page: www.facebook.com/PattayaSoulClub for more information and updates. A Joint Chambers Eastern Seaboard networking evening will be held at the [email protected] Siam Pattaya hotel on Friday, August 25 from 6.30 p.m. – 9 p.m. (last drinks at 8.30 p.m.). Entrance cost of THB 400 for members and guests of participating chambers and THB 800 for non-members includes free-flow drinks and finger food. Cash payment at the door. For more information send email to [email protected]. Jesters Care4Kids charity drive will be holding a special fund-raising Gala Evening at the Hard Rock Café Pattaya on Saturday, September 9. Ticket price: 2,500 baht includes international buffet, free flow wine, beer and soft drinks plus some great entertainment including a live performance by former Guns N’ Roses guitarist Ron Bumblefoot Thal. To reserve tickets, email to: [email protected]. 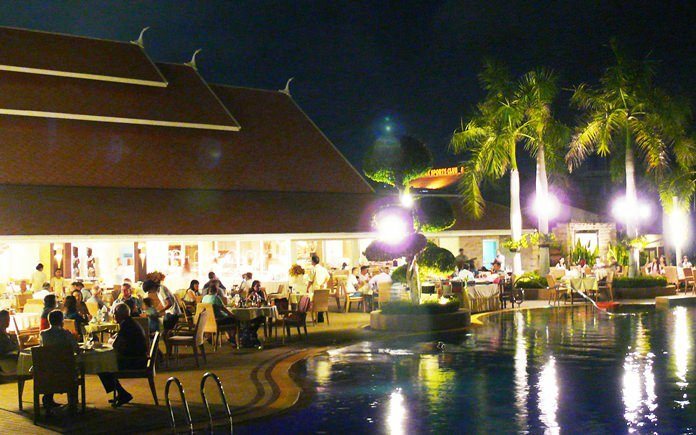 Yupin’s Restaurant in Jomtien Complex offers a fabulous 3-course menu (5 choices per course) for just 480 baht. 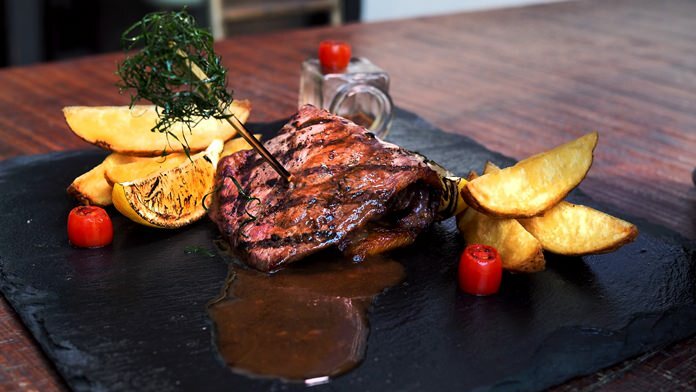 Main course options include pork fillet medallions with green apple sauce, grilled red snapper with saffron sauce, pork chop with black pepper sauce, grilled chicken with mustard sauce or spaghetti with carbonara or bolognaise sauce. 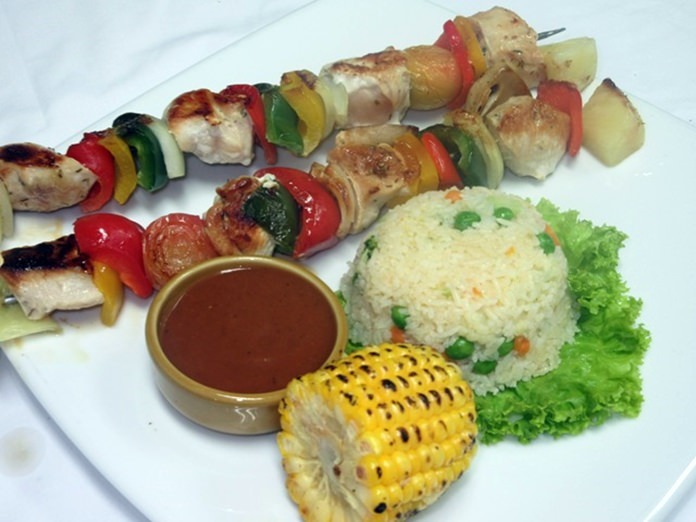 All include a wide choice of delicious starters and desserts. 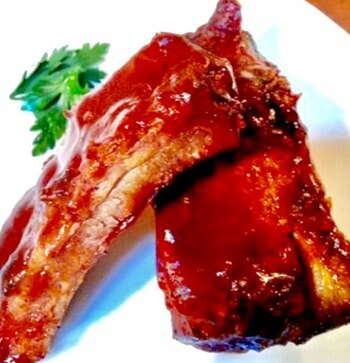 Chef’s special this month is Yupins honey glazed slow roast pork with gorgonzola sauce. For more information or reservations, call 038 250394 or visit website: www.yupins.com. The Thai Garden Resort invites you to an Austrian Heurigen Night on Thursday, August 10 from 6 p.m. – 10 p.m. 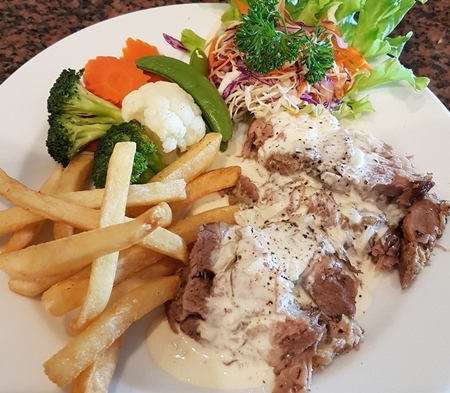 Enjoy a wide variety of traditional Austrian and international cuisine for 399 baht net per person (Children under 12 years of age – 199 baht net). For each paying adult one child gets to eat at the buffet free of charge. Buy 6 tickets and get one free. Great entertainment provided with traditional Austrian music. All nationalities welcome. 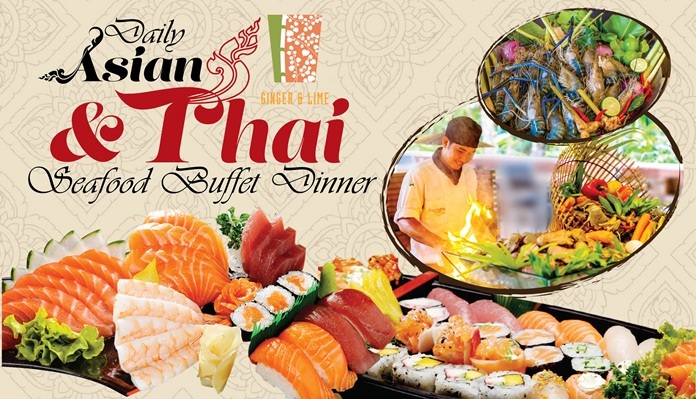 For reservations call 038 370 614 or make your booking at www.thaigarden.com. Thai Garden Resort is located on North Pattaya Road, 200 meters from the Dolphin roundabout and 200 meters before Tesco Lotus. Somsakdi with his trademark towel over his left shoulder. The Bay Grill & Buffet at Dusit Thani Pattaya: Dine with a sea view and enjoy seafood and meat barbecue accompanied by Thai and international items from soup, appetizers and main courses to dessert for only THB 900++ per person. Free flowing beverage for additional THB 599++ per person. The Bay is open daily from 18:30 – 22:00. Call 038 425 611-7 ext. 2149 0r 2150 for more information and reservations. 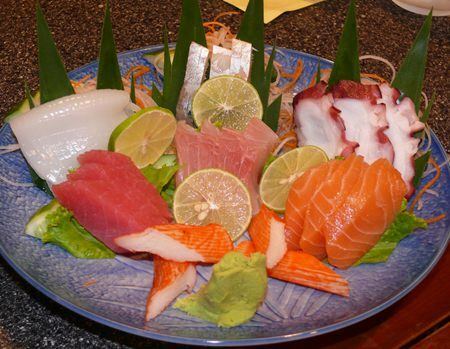 Enjoy a seafood buffet dinner at Ginger & Lime. The evening dinner buffet at Ginger & Lime has just become even bigger and better with Chef Pinyo adding an array of new dishes to this enormous spread of Thai, Japanese and Asian specials. Served seven evenings a week in the serene gardens of Centara Grand Mirage Beach Resort Pattaya, with indoor and outdoor seating available, the new buffet is priced at only THB 888++. Chefs at the wok fry station are ready with a whole range of fresh ingredients to whisk up whatever you wish, while over at the noodle station the chefs have stewed duck, deep-fried pork belly and BBQ pork amongst their attractions. The desserts selection is huge, and new on the buffet is crepe suzette, and deep-fried banana Thai-style. Ginger & Lime Restaurant opens daily from 18:00 – 23:00 hrs. Call now for reservations at 038 714 981. Linda’s Restaurant is large with seating for 200 people, with a covered al fresco verandah outside for those who wish to smoke. Inside, in air-conditioned comfort, there are comfortable chairs and decent sized tables, with white starched napery. The menu is large and covers northern European items, Scandinavian dishes and several pages covering Thai cuisine. Linda’s Restaurant, 315/177-180 Moo 12, opposite the Jomtien Complex. Thappraya Road, Jomtien. Open seven days from 7.30 a.m. until late. Tel: Reservations: 038 252 726, www.lindasrestaurant.com, street-side parking. Email [email protected] . GPS 12.901655 N 100.869. Great 3-course menu options at Jameson’s. Jameson’s Pub offers a weekly 3-course special menu at just 395 baht (net) available Mon-Sat from midday to midnight. Fabulous roast dinners with all the trimmings are also available every Sunday, priced from 340 baht – 400 baht. New to Jameson’s is a complimentary car service which picks you up from your home and takes you back again in a chauffeur driven vehicle. Jameson’s is located on Soi Sukrudee (Soi A.R.) in Central Pattaya. Call 038 361 874 for more information or visit website: www.jamesons-pattaya.com. Enjoy a 3-course business lunch set at [email protected] Design Hotel Pattaya. Hilton Pattaya invites you and your family to celebrate Mother’s Day with a special dinner buffet at Edge restaurant on 11 & 12 August. Dine with your mom and receive a “buy 1 get 1” treatment voucher for eforea spa at Hilton Pattaya, limited to one per table. The dinner buffet features a wide selection of cuisine including Alaskan king crab, Fine de Claire oyster, grilled seafood selection, roast duck, dim sum, grilled suckling pig and selection of traditional Thai sweets. Edge also has special home-made desserts prepared with love for mom’s special day. Mother’s Day Dinner is available for THB 1,500 net per adult and child under 6 years dine for free, from 6pm – 10.30 p.m. at Edge on level 14 at Hilton Pattaya. Advance reservations recommended. Call 038 253 000 or email: [email protected]. Mom Eats FREE at Hard Rock Hotel Pattaya – 12 August. This Mother’s Day, celebrate with mom by experiencing a new buffet spread at Starz Diner from 6:30 p.m. – 9:00 p.m. featuring charcoal-grilled prime meats, seafood and mixed skewers served directly from the grill and continuously to your table. All for just THB 1,299 per person. For every four paying guests, Mom will get to dine for free and receive a stalk of rose. This promotion is not applicable in conjunction with other offer or promotions. For reservations, call 038-428755-9 ext. 8323 or e-mail: [email protected]. Eforea Spa offers a deep relaxing massage using the power of aromatherapy oils and traditional Thai massage techniques followed by an exclusive half-hour choice of herbal hot compresses or hot stones placed on key energy points. Complete with a pressure point facial massage and de-stressing scalp treatment to maximize relaxation and a completely new body experience. ‘Pampering of eforea’ package is priced at THB 4,500 per person and THB 8,000 per couple for 2 hours and available from August 1 – October 31, 2017. Eforea Spa is located on level 17 of Hilton Pattaya and open daily from 10am – 10pm. For more information call 038-253- 000 or email: [email protected]. Spa Cenvaree at Centara Grand Mirage Beach Resort Pattaya brings the luxurious and sensual touch of dragon fruit and peach blossom, with the ‘Pretty as a Peach’ spa package. This 120-minute spa journey is priced at THB 2,595++, and in addition includes a free luscious peach body lotion, valued at THB 450, to take home. For reservations call 038-301234 Ext 4333 or send email to: [email protected] , website: www.spacenvaree.com. AVANI Pattaya is currently offering a great accommodation & show package: Stay in your Garden View room for a minimum two consecutive nights and enjoy a Thai set dinner for two at Sala Rim Nam restaurant plus round trip transfers to the Singha D’Luck Theatre in Pattaya and tickets to watch the mesmerising KAAN show. Prices start from THB 6,500++. For more information, please call AVANI Pattaya Resort & Spa: 038 412120 or email: [email protected] www.avanihotels.com. Pattaya Classical Music, in conjunction with Pattaya Orphanage presents a performance of the Choir of Gonville & Caius College, Cambridge University on Sunday August 27 at 5 p.m. in the auditorium of the Pattaya Orphanage. The program will be a varied mixture that should cater to all musical tastes. Tickets prices are 500 baht (300 baht for children) and are available from Pattaya Orphanage, Pattaya City Expats Club and Pattaya International Ladies Club. Pattaya Players community theatre holds free monthly comedy improv workshops at the Robin Hood Tavern at the Avenue Mall on Pattaya Second Road. Everybody welcome, ages 12 or over. No experience necessary. Call Sheldon at 092 413 7876 or Email [email protected]. Post 12146 of the Veterans of Foreign Wars of the United States of America (Ban Chang – U-Tapao, Thailand) meets the second Saturday of each month at 13:00 on the second floor of the Camel Pub in Ban Chang. If you are interested, please contact Membership Chairman Dan Morgan at banchangvfw [email protected] or visit website: www.banchangvfwpost12146.org.